Property Size 6,200 sq. ft.
Wake up to a morning sky filled with hot air balloons!! This elegant Wine Country estate is located walking distance from wineries/vineyards. The main house offers 6,200 sq. ft. of luxurious living space.The home has professionally decorated decor, and endless mountain and vineyard views from multiple rooms. From the moment you enter this home you will appreciate it`s richly furnished amenities.This private estate exudes luxury from it`s 26 seat home theater, beautiful 2,700 sq ft detached 2 story guest house complete with billiards and 82 inch big screen TV, private pool, ping pong table, air hockey table, play house, child`s play ground, gourmet kitchen, and millionaire vineyard views. Exquisiteness is reflected in every detail of this estate and we invite you to experience all it has to offer. 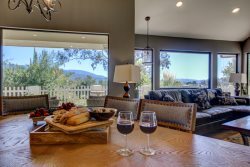 Enjoy walking to one of the many great Temecula Wineries from this beautiful 4.5 acre vineyard estate! Experience all Temecula has to offer including dining, dancing or shopping in "Old Town". Spend your evening relaxing bar-b-q`ing with friends and family, OR, try your luck at the Pechanga Casino & Resort, California`s biggest and best casino. Don`t forget the many jazz festivals that are hosted by the local wineries, nice intimate venues to listen to some of your favorite artists. If your up for a bit of a drive, the San Diego Wild Animal Park is just a quick 45 minutes drive south, or go a bit further about an hours drive and spend your day at Balboa Park taking in the many museums and the world renowned San Diego Zoo...Oh!, and don`t forget about Disneyland, Six Flags, Legoland, all about a 60 minute drive. Multiple wine tour transportation options (at the door pick up service) available for purchase. We had our entire family stay in this gorgeous home when my Grandson got married at a nearby winery. My grandson and his fiance were the first of our group to arrive, and his response was, "I want to stay forever!". Our entire family was in awe of how beautiful this home is. The teens totally enjoyed having the pool table in the guest house. We really enjoyed sitting out on the patio Saturday morning, while drinking our morning coffee, and watching the hot air balloons floating by just outside the house. The view was awesome! The house sits up on a hill out in the wine countryside, and there are no street lights or signage out there to direct you to the house. So if you are arriving after dark, like we did, you NEED GPS to tell you where the turn-off is to go up the hill. I would recommend that you arrive during daylight. All in all, it was an amazing weekend, and our family totally enjoyed living in luxury!